And the Classic Achiever Statue goes to . . . whomever you think deserves it. These statues will surprise and delight any movie fan, actor, or actress, but these replicas are versatile awards that may be used to reward someone for a variety reasons. They come in a variety of sizes and prices too. Made from cast metal and hand polished, the sculptures have the feel of durability and quality. 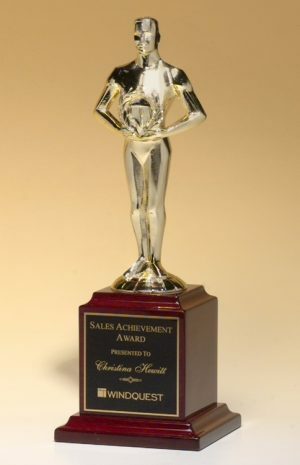 All of our Classic Achiever Statues may be personalized, so you may place the recipient’s name, a date, and a reason for the award on the award’s base. Our graphic artists will use a laser engraver to place your words on any of these statues, and we will do it for free. Place an order of over $100, and we will include free shipping too! Make someone you know feel special without walking the red carpet. Give a Classic Achiever Award today.